Kiln Corner enjoys a particularly choice location on the cusp of the sought after village of Saltwood yet within a pleasant walk of the centre of Hythe. Saltwood's picturesque village green, local shop, public house, historic church and castle, all virtually on the doorstep. There are two excellent primary schools in the vicinity, Saltwood C of E Primary school being just along the road and Brockhill Performing Arts College is within walking distance. There are two highly regarded Grammar Schools in Folkestone with a regular bus service providing access to both, public schools are accessible in Canterbury, Ashford and Dover. Hythe town centre, with its bustling High Street offering a range of independent shops, boutiques, cafes and restaurants is within walking distance or only a short drive away and there are also 4 supermarkets within the town including Waitrose. There is a variety of sports and leisure facilities in the vicinity, including sailing, tennis, bowls, etc., together with the Hotel Imperial Leisure Centre and two golf courses. There are many footpaths and bridleways nearby, ideal for horse riding or dog-walking, along with Brockhill Country Park, where there is a play area and other organised outdoor activities. Commuting links are excellent with the motorway network (M20 Junction 11) 2.5 miles distant, main line railway station at Sandling 2 miles, the Channel Tunnel Terminal 3.5 miles, the ferry port of Dover 13 miles and Ashford International Passenger Station 12 miles. The High Speed Link is available from both Folkestone (5 miles) and Ashford (12 miles) with journey times to St Pancras of around 53 minutes and 38 minutes respectively, 54 minutes from Sandling (all times and distances are approximate). 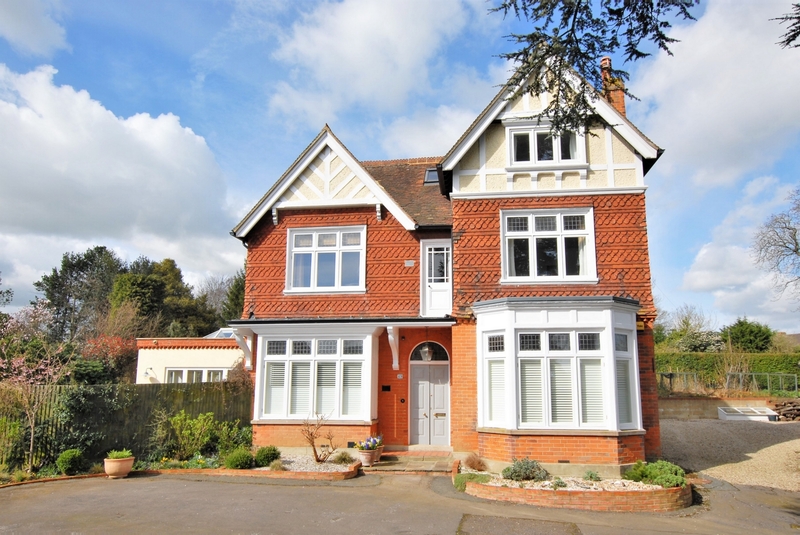 This fine Edwardian house has been the subject of an extensive and sympathetic refurbishment for the current owner who has paid meticulous attention to every aspect of the project, the result is stunning with exquisite detailing and an exceptional standard of finish throughout. This imposing property stands in grounds of around 0.57 of an acre and is approached via double gates opening to a generous driveway and turning circle before the handsome façade, the drive continues to the side of the property where there is a detached double garage and vegetable garden. To the rear of the house the beautiful gardens enjoy a southerly aspect, are delightfully secluded and provide a wonderful environment in which to enjoy an alfresco lifestyle. The accommodation, which totals around 3077 square feet, is light, airy and elegantly proportioned with a grand yet welcoming reception hall leading to the drawing room, dining room and study beyond which is a delightful garden room. The breakfast room leads to the vaulted kitchen which is beautifully fitted with Thoroughly Wood bespoke cabinetry, granite work tops and top end appliances. There is a utility room, boot room, wine cellar and two cloakrooms. Arranged over the first and second floors there are five double bedrooms, the master with a palatial en-suite bathroom, the guest room with en-suite shower room, a bathroom and shower room.